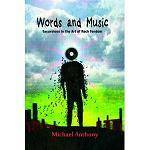 More information: Words and Music is a thought-provoking and entertaining guide to the joys and perils of rock fandom. For anyone of any generation who loves their rock music, it certainly doesn't disapppoint! There's a fascinating mix of anecdote and analysis, as the author discusses a wide range of bands including Deep Purple, Black Sabbath, Bob Dylan, Led Zeppelin, Marillion, the Doors, Magnum, Saxon, Iron Maiden, Motörhead, Metallica, Twelfth Night, Geoff Mann and more. It doesn't matter whether you're a fan of the particular bands discussed or not. What matters is the experience of being a rock fan, and I think the author does a very good job of describing this. "I see rock fandom as one big discussion," he writes in the introduction, "and this book is my contribution to that discussion".